In the blink of an eye, a car, truck or motorcycle accident can change your life and your family forever. Fighting to protect your rights and recover full compensation for your injuries is often a difficult problem that most people don’t know how to deal with. When you have been involved in a car accident, you are up against more than just the person whose negligence caused the accident. You are up against a large insurance company, possibly even your own. Accidents happen in a flash and short-term memories are fragmented at best. The insurance companies know this and, because they are permitted to visit your hospital bed, they often take your statement before you’ve had a chance to put any of the pieces back together. They can bind you with this later. THE POINT: Don’t talk to someone from the “other side” until you have consulted with someone on YOUR SIDE. THE KAPLAN/BOND GROUP is on your side. 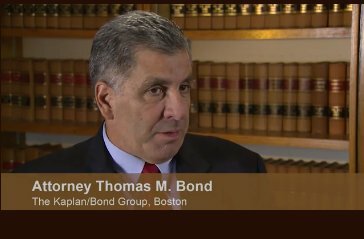 At THE KAPLAN/BOND GROUP, based in Boston, we are ready to help you recover compensation for your financial and punitive damages resulting from a car accident caused by another driver. We are familiar with the tactics used by insurance companies and aren’t afraid to act aggressively to protect your rights. Our opponents are often large auto insurance companies with layers of insurance defense attorneys on their side. We are aggressive and thorough in the representation of our clients, well-respected in the legal community, and have a solid reputation that precedes us in the state, federal and appellate courts. Contact us to discuss your motor vehicle accident injury claim. From our offices in Boston, our personal injury trial lawyers represent negligence victims throughout Massachusetts. We have the professional, technical and financial resources to provide legal advice and representation you can rely on for results. Car accident injuries often require special knowledge about soft tissue injuries and the long-term impact of the accident. Our trial lawyers understand the issues and know now to prepare the strongest possible case for negotiations or trial. We regularly handle complex car accident cases and consult with some of the most highly regarded accident reconstruction experts. We also use the latest technology to create compelling presentations for opposing counsel, the insurance companies that hire them, and the judges and jurors that control the fate of each case. Contact our office to schedule a free consultation with one of our trial attorneys. We are ready to help you fight for the compensation you are entitled to.